For the Sega Game Gear and Master System game, see Sonic Blast. Sonic 3D Blast is an isometric platform game in the Sonic the Hedgehog series, developed in the UK by Traveller's Tales (rather than Sonic Team or STI) and published by Sega. 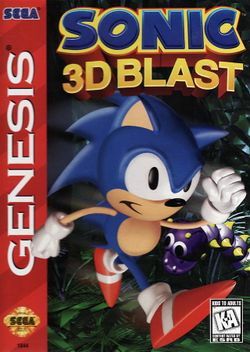 It first appeared on the Sega Mega Drive in November 1996 in Europe, the UK, Japan, Australia and New Zealand under the title Sonic 3D: Flickies' Island, but was renamed for its North American release to form a connection with the Sega Game Gear game Sonic Blast. The game was published directly to Windows in 1997, and later made available via GameTap around 2009, however all Sonic games were removed from Game Tap at the end of 2009. Archie Comics published a comic adaptation of the game for a 48-page special, published in January 1997. A loose adaptation of the game also appeared in issues #104-106 of Sonic the Comic.